1. Heat the grain pouch according to the pack instructions. 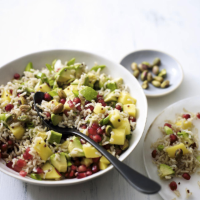 Mix the mango, avocado, pistachios, pomegranate seeds and salad onions together and stir into the rice mix. in a large bowl, with raita (see cook’s tip) on the side, if you wish. For a quick raita, stir together Waitrose Greek Natural Fat Free Yogurt, grated cucumber and torn mint.